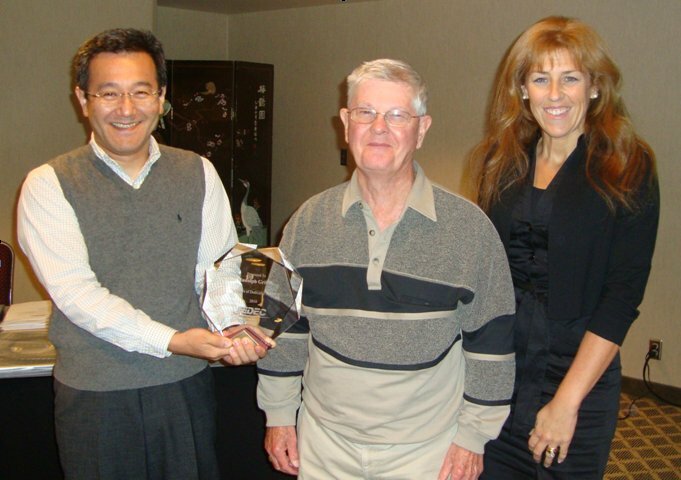 JC-11 Chairman Takao Ono presents the award to Mr. Rudy Griffin, as JC-11 Secretary Julie Carlson looks on. Mr. Rudolph “Rudy” Griffin, Vice Chairman of JC-11, was presented with an award for thirty-five years of service to JEDEC and the industry in a ceremony at the recent JC-11 Committee meeting in Seattle, Washington on October 13, 2010. Mr. Griffin is the first member in the history of the JEDEC awards program to be recognized for thirty-five years of service. As a JEDEC volunteer, Mr. Griffin has been an active member on the JC-11 Committee, and also participated on the JC-13 Committee for a time. He began attending meetings in 1975 representing first Signetics, then Philips, and presently National Semiconductor. He has sustained a level of leadership by holding several positions as chairman. Mr. Griffin has volunteered for over 10 years as the Vice Chairman of JC-11, and has been acting chair during transition periods of JC-11 several times through the years. Rudy has also been the chairman of JC-11.1, JC-11.2, JC-11.5, JC-11.10, and JC-11.11 point committees during his service and has chaired Task Groups for the SSOP and TSSOP Packages. Mr. Griffin has been the sponsor of several published registered outlines. He sponsored the registration for the wafer level, Die Size Ball Grid Array CSP (MO-211), the first wafer level CSP registration. He also sponsored the registration for the QFN (MO-220), the first QFN registration. Both packages are widely used in the mobile industry. A mentor to many, Mr. Griffin is well respected within the committee and has an extraordinary knowledge of the industry and how the committee functions. He often volunteers to work off line with “newcomers” to bring them up to speed on JEDEC processes, and to provide technical guidance as to the formation of drawings and what is needed to make an “approvable” outline. Mr. Griffin is dedicated to the process of standardization, and his ability to maintain uniformity and knowledge of dimensioning are valuable assets to JC-11 as well as the packaging industry. He continues to contribute at the same high energy and skill level after all this time. “JEDEC is honored to confer this recognition upon Mr. Griffin, and we are grateful for his long-standing dedication to JEDEC and the industry,” said Mr. John Kelly, JEDEC President.